INSANITY MAX:30 Results: Guy Lost 29 Pounds in Four Months! Guy Stanley lost 29 lbs. 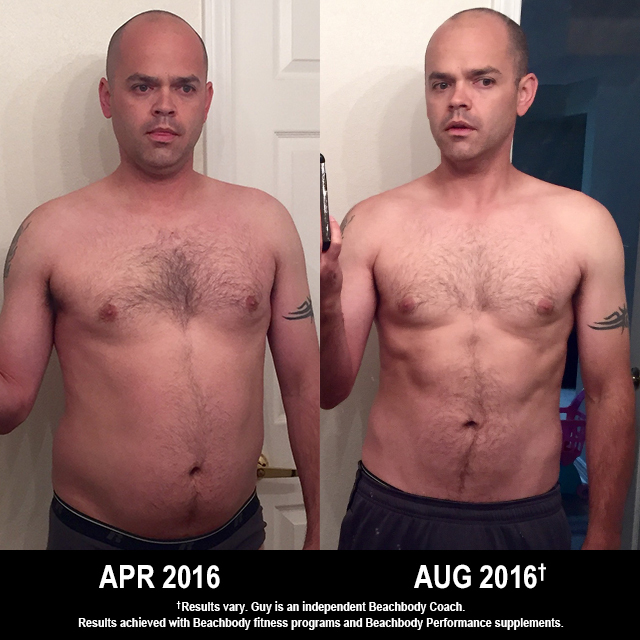 in four months with INSANITY MAX:30, Shakeology, and the Beachbody Performance supplements. He entered his results into the Beachbody Challenge, and won the $500 Daily Prize for October 4th! I work long days at the office, and the first thing I usually did was come home, crack a beer open, and sit on the couch. I would try and play with my kids for a bit, and maybe think about cooking the easiest dinner I could think of. I didn’t sleep well. I always felt sluggish, and I was lucky to get in two to three workouts a week. My wife started the 21 Day Fix in January. She did a couple of rounds and had tremendous success, especially with the portion control. I figured I was already eating some of the stuff she was and her weight loss, increased energy, and just overall happiness was incentive enough for me to give it a shot. I figured it certainly couldn’t hurt to try. I could usually get on board with exercising regularly… as long as the weather was nice. I like to run and I’d lift weights when my schedule allowed it, but I couldn’t consistently eat right. I didn’t really know what to eat. More salads? Go to bed hungry? Skip a few drinks? Once I was a week into my first go at drinking Shakeology every day and combining it with the portion-control nutrition plan, along with my 30-minute workouts, my energy and overall happiness skyrocketed. The pounds definitely came off quickly too. I need something that is convenient and doesn’t take up a lot of time in my day for me to stick with. I really like streaming the INSANITY MAX:30 program. I can get it done in my basement before anyone else is up in the morning. Shakeology was something very new to me, and I was definitely skeptical in the beginning. But I found that it got me through my day better than multiple cups of coffee, curbed my hunger, and quickly became my favorite way to recover after my workouts. I lost 29 pounds in four months! I don’t have multiple chins anymore. I can actually see my abs. I really didn’t think it was possible for me to get the muscle definition I did, and I’m continuing to see the pounds drop. My endurance has also vastly improved. I hate to say it… but I usually easily pass up the cookies, cake, and sweets always in the break room at work. I drink one cup of coffee and about 15 cups of water each day. I am not exhausted at night and unable to chase my kids around. I have planned out what I’m going to eat for dinner. I follow the 80/20 rule now thanks to the portion-control containers. I’ve kicked my two diet sodas a day habit. I sleep like a rock now. My energy and happiness are where they should be — a priority. My wife is my Coach, and she puts a lot of effort into her groups. She is really good about the meal prepping and finding easy ways to stick to it. I needed that. Being able to check in with her daily made me accountable for what I ate throughout the day and making sure I got in at least 30 minutes of working out. Well, she’s my wife so she is extremely loyal! She is there for me daily. We hold each other accountable with our nutrition and getting our workouts in. We even do a mental container count check when we go out to eat! She does these groups at least once a month, if not more, so I’ve been lucky to always have a ‘spot’ in her group. I’m so used to always being in a group that it’s definitely taken on more of a lifestyle, not just a quick fix. Though ironically, I definitely continued on because of my quick-fix results. I’ve been drinking Shakeology for four-plus months now, and I definitely notice if I miss a day that I feel a bit ‘off’. Shakeology has given me the daily energy I need to get through stressful days. It is my go-to breakfast, and a huge byproduct of my increased energy and curbed appetite is the weight loss.2 I’m at my lowest weight since high school.